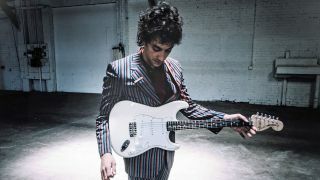 Hammond Jr.’s favorite guitar — a 1985 reissue of a ’72 Fender Stratocaster — has now been reproduced as Fender’s new Albert Hammond Jr. Signature Strat — and Fender and Hammond Jr. have even thrown in a few personal (and very cool) touches of the guitarist’s own design. The guitar features an alder body with a period-accurate gloss polyester finish and a “Modern C”-shaped neck with a 7.25”-radius rosewood fingerboard, just like a ’72 Strat. This guitar also replicates Hammond Jr.’s customized pickup wiring: position four activates the neck and bridge pickups in tandem, akin to a Telecaster with the toggle switch in the middle position. Positions one and three are reversed so that position one activates the middle pickup while position three activates the bridge pickup. Hammond’s signature graces the back of the large Seventies-style headstock; other Seventies-inspired features include a bullet truss rod nut, a three-bolt “F”-stamped neck plate with period-correct Micro-Tilt adjustment and an era-accurate Fender logo. And then there’s the guitar’s attractive suggested retail price: $874.99. “I hate the idea that people think they have to spend a lot of money to get a decent guitar,” Hammond Jr. says. “A good guitar should also be affordable and attainable for all working musicians. That’s what this Strat is: a great playing- and sounding-guitar. It’s a vehicle that’ll bring out the best in you.